I have already discussed military reports on many occasions here. Some examples have been shown to you as well. So today, I decided to take into other forms of writing you may be required to write during exams or your everyday work. If you are a staff officer, most probably you deal with memoranda as often as with reports. A Memorandum, also called a memo, is a frequent piece of writing used in business communication too. Memos are used mainly to communicate some important issues to subordinate staff. They can also be used to persuade somebody to take actions, give feedback on something or react to previous concerns, documents or issues discussed. A memo will be usually addressed to your co-workers or people who you had worked with before. Anyway, do not assume that they have all the contact data and provide it in a clear, visible form. It’s good to follow an effective format of any memo which contains subsequent sections called “to,” “from,” subject,” “date.” Those text markers along with other talking headings will make your memorandum orderly and reader-friendly. Since memoranda (watch the plural form – it’s from Latin!) may be distributed freely, you can receive a document which is not relevant for you. Likewise, your memos (this time regular plural form!) may reach the addressees who are not interested in it at all. Therefore it is a common practice to make a clear purpose statement at the beginning of our memo. This statement will clearly define the purpose of the paper; it should be concise and direct. 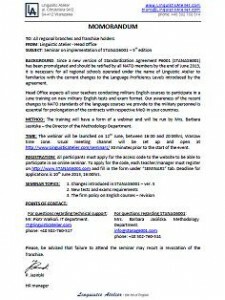 This entry was posted in general English, language skills, Writing and tagged exam format, memo, memorandum, military English, pisanie, STANAG tests, tests, wojskowy angielski, writing, writing samples on 06/30/2013 by Paweł Jasiński.